Modern scientific methods help explain what accounts for the musical sound of a bowed stringed instrument. The body of violins, including their front and back plates, their sides as well as the air they contain, all function as part of the process of transmitting the string vibrations through the bridge into the air surrounding the instrument. 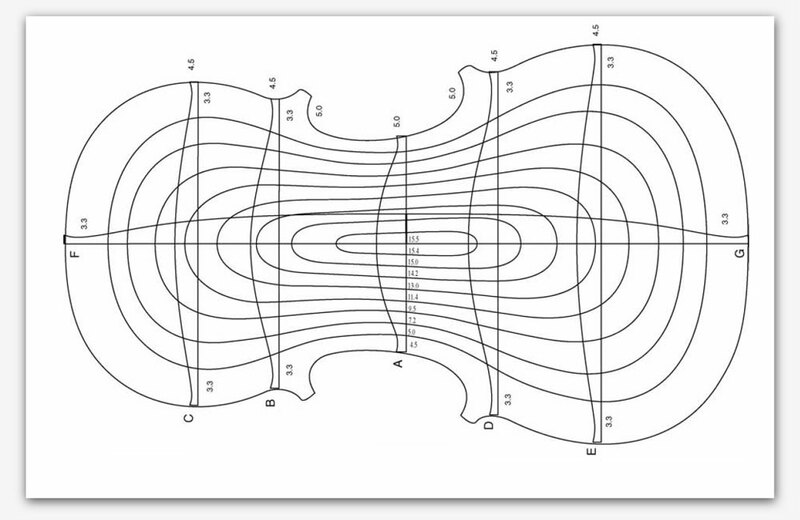 The surface area of the violin is in direct relation with the amount of air it vibrates back and forth. 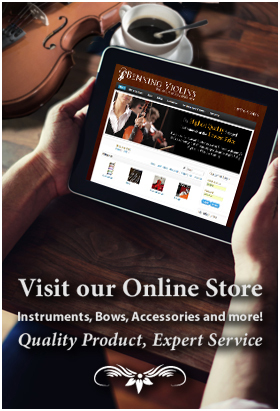 The front and back plates are designed by the violin maker to move easily up and down. At certain tones the plates resonate more easily when played. Chladni patterns are used for finding these modes by placing sand grains on each plate and vibrating the plate through all frequencies. At specific pitches, the grains will take the shape of lines or “nodes” which will indicate a stronger resonance of sound. The air inside the body of the stringed instrument is especially important in the low range of the instrument. Like blowing across the top opening of a bottle, the air’s vibrations, called the Helmholtz Resonance, are a part of the violin’s acoustics. Lower than the lowest resonances of the plates, the resounding in the air increases the sound output around the pitch of the second lowest string. High pitch Helmholtz Resonances can also enhance some higher note fundamentals, as well as harmonics of lower notes. Timbre vibrato is another effect through which a pitch is transmitted largely due to the acoustic response of the violin body. Creating a vibrato with the finger on the fingerboard causes the string’s pitch to move up and down as it is vibrated using a violin bow. As certain harmonics carry more strongly in the violin body, a wider range of pitches means the wider range of transmission of a note can be carried. Thus, the sound is louder and more perceptually interesting.